After Klax and Marble Madness, here’s our third game from the Midway collection… or extravaganza. Not to be confused with Spy vs Spy, a cartoon that was turned into a game (that I actually remember), this is a top down car chase game. 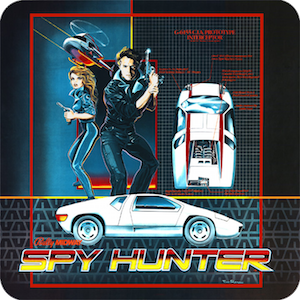 Spy Hunter isn’t necessarily the most complicated game. Almost Paperboy like, you run down the street, avoiding a variation of hazards, although here to catch someone rather than throwing out papers. Well, and not looking quite as good. It’s simple but effective, racing, avoiding other cars or crashing. As you advance, you can gain some additional weapons to stop the spy, as long as you can get into the truck, Knight Rider style. It’s addictive enough, exhilarating as you run through the remarkably varied environments. Crashing is easy, but the game gives you some time to get used to it. Only after you’re some distance in do you start losing life when you crash – at first you get your chance to just play. It’s remarkably merciful for the night and useful. Spy Hunter isn’t a very complicated game. It’s simple and straight forward, and fun in that simplicity. It’s worth getting lost in.